The donation box made by Alan Brown. Photo By N Williams. In 2016 the Club lost a good friend & a great exhibitor of Dutch Bantams. Kevin Hutchinson will be missed by so many of us within the club & the fancy in general. In his memory, the club members donated to buy a trophy which will be awarded to the Best Black Dutch at The National each year. This year's winner was Jos Parsons. The Kevin Hutchinson Memorial Award. Photo By J Eardley. 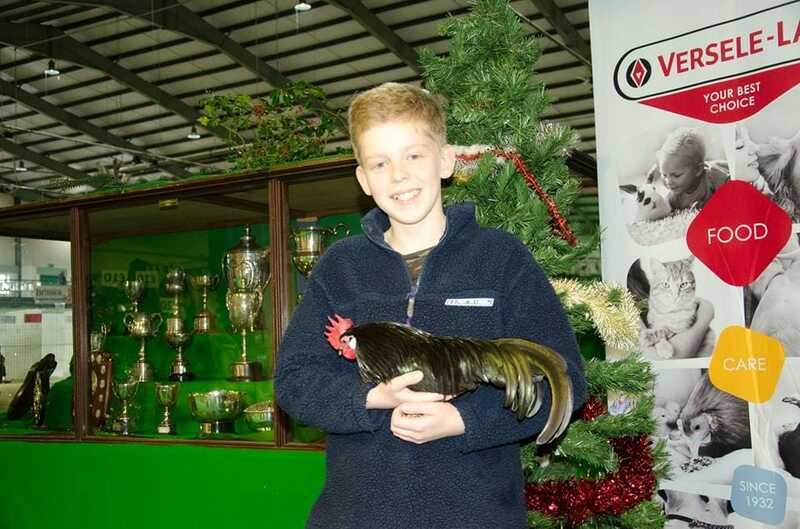 Jos Parsons with his Black Dutch cockerel. Photo By R Stephenson. Black Dutch cockerel, owned by Jos Parsons. The first winner of the Kevin Hutchinson Memorial award. Photo By R Stephenson. _The Dutch Bantam first appeared in this country in the 1960's and a club formed in 1982. Since then the group has gone from strength to strength and celebrated its 30th anniversary in 2012. It exists today to promote Dutch Bantams as an exhibition breed to both members and non members of the showing fraternity and boasts a healthy membership, who continue to produce high quality exhibition birds from England, Scotland, Wales and Ireland. The club has strong links with other clubs around the world especially the Hollandse Krielen Fokkers Club in the Netherlands.